This book was read as part of my 2014 Goodreads.com Reading Challenge. 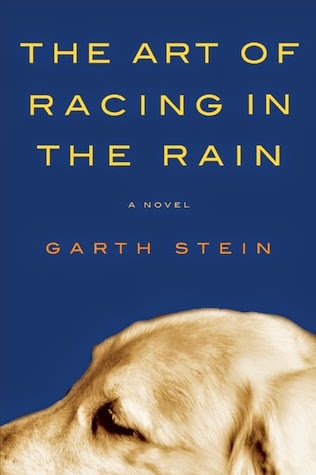 Garth Stein has created a wonderful book based around the reminiscences of a dog in the hours before he is going to be put down. Enzo the dog in question is a reincarnation believing, opposable thumb envying, lovable narrator, who as he accepts that is time is nearing an end and taking the reader on a tour back through his life constantly shows his unwavering loyalty to his master Denny Swift, an up and coming race car driver. The book shows the life of Denny and Enzo from the view of the faithful companion. How relationships affected them, how Denny's love of motor sport imprints itself on Enzo, the birth of children and what that meant to Enzo and Denny and how illness of loved ones affect them. The book is both heart-warming and heartbreaking in equal measure and the ending, Oh it was perfect. The book is fantastically well written and you cannot help but fall in love with the characters involved and that makes sharing their ups and downs all the more emotional. A must read for dog lovers and well everyone else too.